SANTA MONICA, CA — In a perfect web world, quality links are a big stamp of approval received from another site (or many sites, sending many, many clicks back to you). 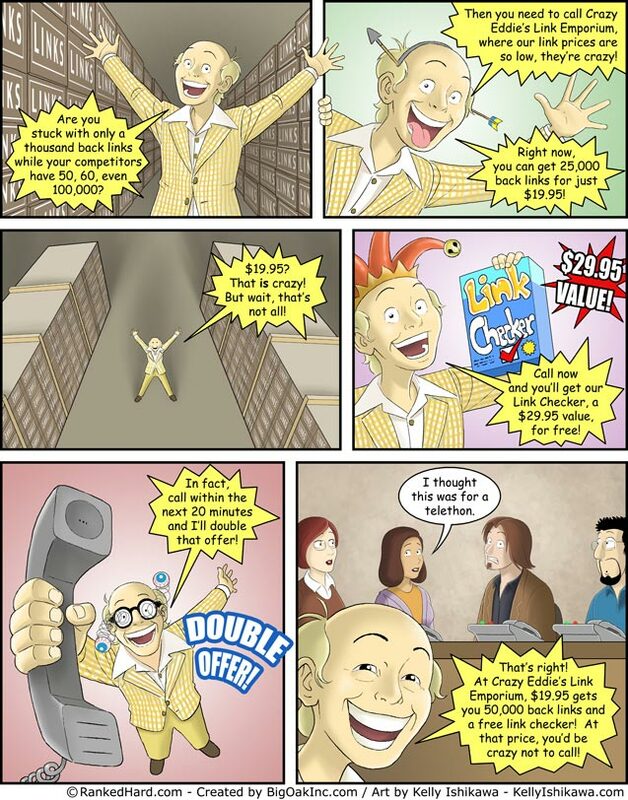 But, especially in the early days of link buying, before it was made such a huge ‘don’t’, there were some pretty funny gimmicks out there, as pointed out in a humorous comic strip by BigOakInc.com. But, the idea of selling links is still out there, even though Google addressed it years ago by putting Google’s Webspam team head, Matt Cutts, on the case. According to an in-depth blog entry by Cutts, the basic problem with selling links is that it makes a link-based reputation seem shallow, and, even worse, it can even make a Google search less reliable if not discovered. Cutts gives an example of the early link buying days, and what went wrong. In fact, the mass buying of links can ultimately render a site unsearchable and get it cast out of Google’s search results, especially if the site is selling links, as Cutts explains. So what should you do to get links? Do you turn to the dark side of SEO practices (as discussed in our Black Hat Vs. White Hat SEO tactics post), and if not, what do you do? According to Cutts, links will come when you have great content on your site, which will help it to rank well on Google. Although, as Ali Husayni somewhat agrees with Cutts that great content is king but he believes that leaving your great content out there without any hands-on link-building efforts will get you no where. In this case, you need to consult a professional white-hat SEO specialist to help you understand what you need to do. One gets to hear a lot about social media links. There are firms out there selling social media links, profile links, social bookmarking ect.. Is that different from buying links on websites? Does it work?